Having realised (see previous post) that the Shoreline project had come to an end, there was one final act I wished to perform to formally close the circle and mark the end of my two-and-half-year stint as Accursed Prophet of the Haunted Shoreline, or whatever it was exactly. It has taken longer than I anticipated for all the necessary conditions to be in place for these last rites, but they have at last been enacted, and I leave you now with the photographic evidence and some final thoughts. This thing began in 2011, with the discovery of the flint ‘head of Anubis’, and as I have noted before this was a most appropriate symbolic initiation into the liminal world of the Shoreline. The theme of cyclic renewal has been a consistent one throughout, and I knew there was only one way to satisfactorily pay tribute to the Shoreline while respecting this principle. It was time for Anubis to go back to the Underworld. 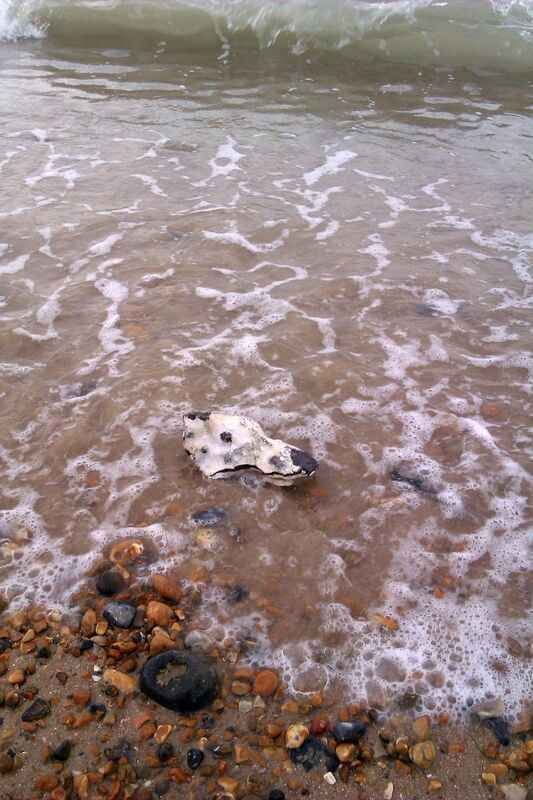 I took the flint head down to the water’s edge as the tide was coming in, and watched as the sea washed over it, knocking it onto its side before it disappeared, bobbing occasionally as I lingered, before finally I turned away and slowly walked home. I felt a sense of gratitude, but also of release. Thank you to all readers for your attention, with particular gratitude to those fellow bloggers who have checked in here regularly, offering comments and encouragement – they know who they are. In the previous post, I mentioned a new project that has started to take shape, and I was flattered when a number of readers contacted me to ask for more details of this. It is not, however, a project that will be publicly documented, at least not in the form that the Shoreline has been, and it is unlikely to have an internet presence. In the meantime, this site’s ‘about’ page has been updated to reflect the fact that the project has now ended. There are a couple of other things to mention before signing off. ‘Underworld Service’, the new album from old friend of the Shoreline, Andy Sharp aka English Heretic, is out soon, and among other delights it will contain a few minutes of a lengthy conversation that Andy and I recorded some time back. Other parts of that recording may see the light of the day in due course. And on September 13th, if you’re anywhere near the East Sussex coast, come to Fort Process – a day of talks and music in the splendidly atmospheric surroundings of Newhaven Fort. Some big names of improv and avant-garde music (Peter Brötzmann, Steve Noble, John Butcher, Max Eastley and Thomas Köner, just for starters) will be playing, and there will also be talks – including one by your correspondent, in which I will cast an eye over the Haunted Shoreline, now that it has been brought to a kind of completion. What was it all about? Were all those signs and portents, gleaned from flotsam and pebbles, of any actual consequence in the end? 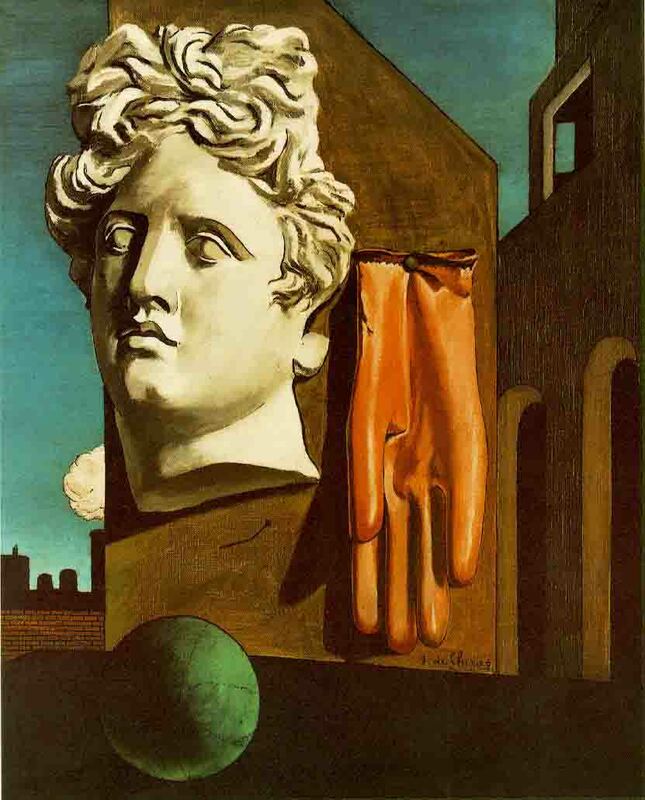 Or was it all just an exercise in playing with symbols and meanings – an amusing enough diversion but, in the end, a frivolous one? As I mentioned once before, the project initially took shape in the aftermath of drastic emotional upheavals and the ending of a previous cycle of my muddled progress through this predicament we call the human condition. For me, it has had a significance that may not be immediately obvious from the sometimes tongue-in-cheek style in which I have documented it here. Events on the Shoreline, and the themes and concepts to which they have persistently alluded, have mirrored events in my day-to-day life to an uncanny degree, in ways in which I would not dream of writing about here. 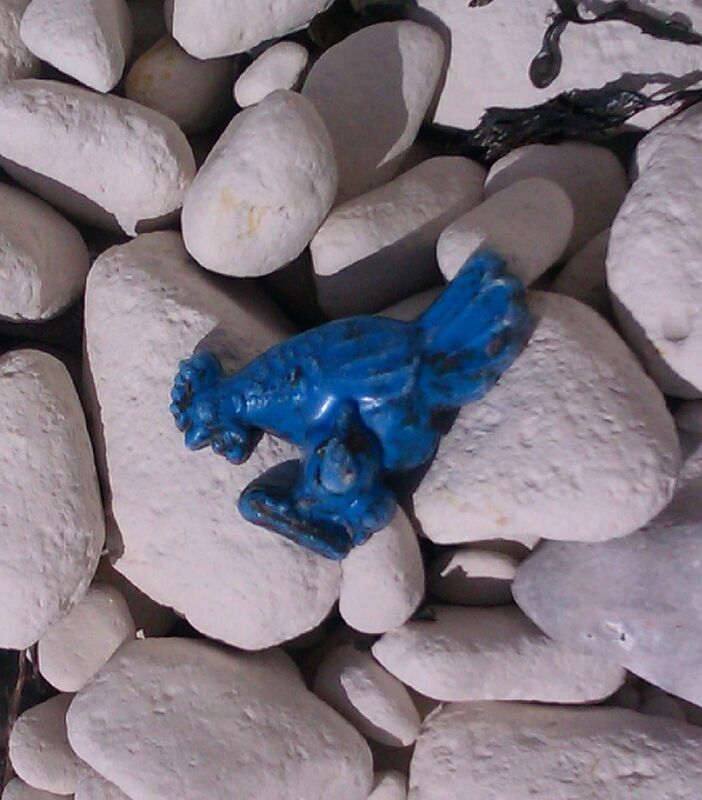 Was there a final culmination to the alchemical quest – did I find the Philosopher’s Stone? Well, no, and I don’t think it works quite like that. But I have completed quite a voyage, and stand now on the threshold of a new venture, a new alchemical process. Having pursued these threads through some intuitive stratagem positioned at the shoreline of art and occult practice, I will say only that the Shoreline, the Haunted Shoreline, made a believer out of me. Thanks, and goodbye. And if you want to dive back in, and let the current take you round once more, go here. For some time now, the Shoreline has been trying to tell me something. It is difficult to pinpoint when it began – perhaps it was the change in the current towards the end of last year, or perhaps it was when the Shoreline manifested the Wheel Of Fortune, with its implicit suggestion of turning full circle, a cycle completed. And indeed I have been mulling that over ever since – only for the Shoreline to admonish this over-analysing, and push me to stop thinking and act. And now, two separate finds have made the message unavoidable. The first is the beach ball shown above. 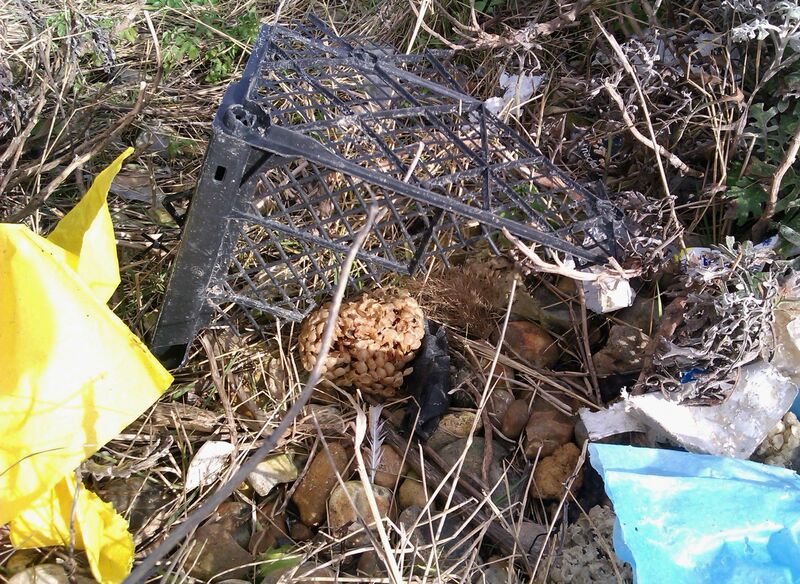 As you can see, it is a representation of the world – and I found it not on the beach but in my back garden. It isn’t mine – my guess is that it was blown into its leafy hiding place during the winter storms, and then lay hidden for months amid the weeds and tall grass, until finally being revealed while I was cutting back the overgrown jungle of the garden a few days ago. In the Tarot, the World is the final card of the 22 Major Arcana – the culmination of the journey that begins with the Fool. It represents completion, ending, the closure of one cycle and the start of another. Some of its pictorial language is familiar from previous communications from the Shoreline: the symbols of the four Evangelists arranged around the corners, and the presence of the great self-resurrecting World Serpent, Ouroboros. 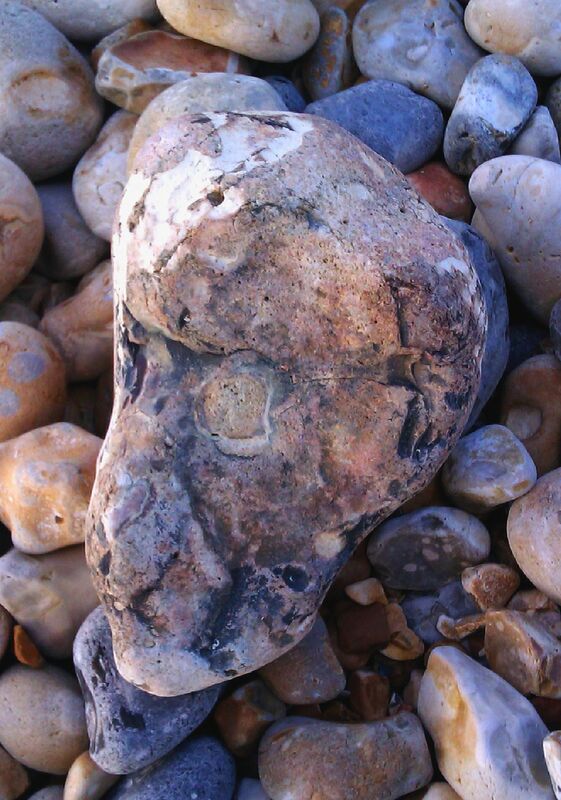 Many of the objects of wonder that have washed ashore and fuelled this strange quest have been in the form of stone faces, but here we have a stone with two faces, one on each side. This, then, is Janus, the Roman god said to rule all the other deities of the pantheon, the god who looks both forward and back, the god of portals and gateways, endings and new beginnings. The message is now inescapable, and to ignore it, or pretend I have not seen it, would be a betrayal of my whole engagement with the Shoreline over the last two and a half years. So this is the end of the Haunted Shoreline project. There will be one further post here, to reflect and sum up, and then your correspondent’s alchemical quest will take a new form. This new venture is currently taking shape, slowly hatching from the egg of Ouroboros, but that is all I can say for now. Thanks to all those who have followed this peculiar saga, and I hope you will join me here again soon for the last rites. The latest avatar of the liminal to wash up from the depths on the Shoreline. Uncertain how to interpret it, I posted this image to a well-known social media site and invited readings. 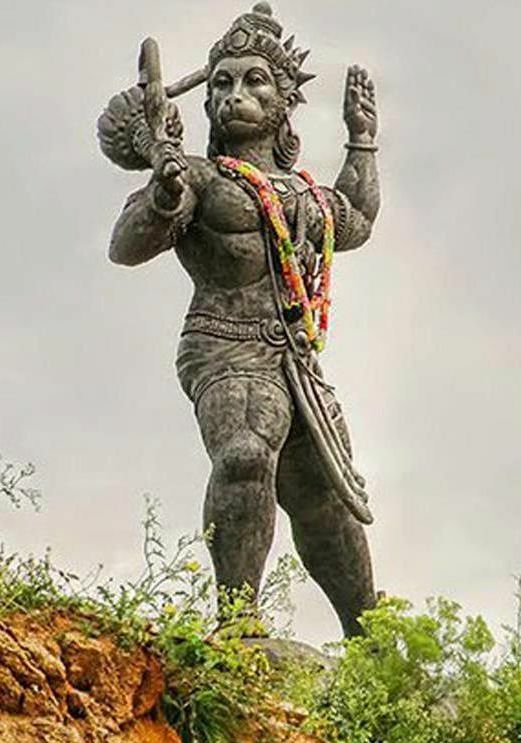 The results ranged from the sublime to the ridiculous, but the one that seemed to me to crackle with truth was the suggestion that this was a manifestation of Hanuman, the monkey-faced deity of the Hindu patheon. Still, I struggled to interpret it. Hanuman plays an important role in the Ramayana, the Indian epic which tells the story of Rama and his struggle against the demon king Ravana. 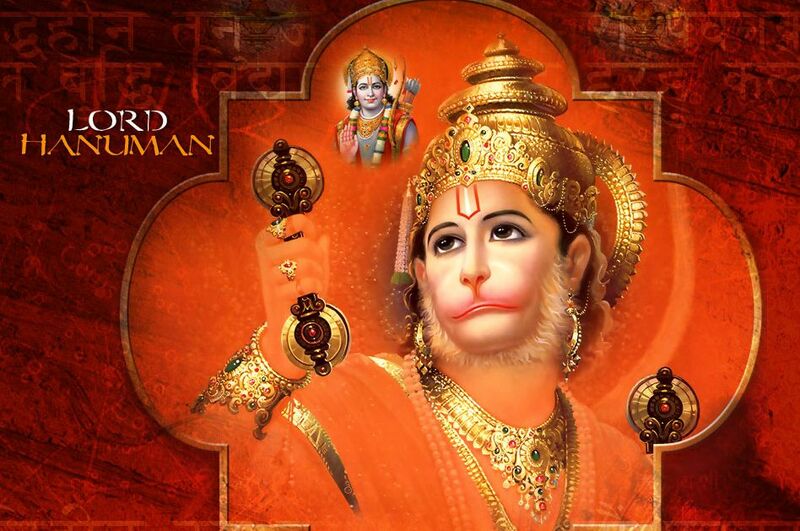 Having puzzled through the various stories associated with Hanuman (go here to try for yourself) I felt none the wiser. Interpreting the artefacts that wash up from the depths on the Shoreline is, of course, a subjective business, but there must be some spark of recognition, some convergence of the objective and intuitive, and I could find none. Some writers link Hanuman with Thoth, the Ancient Egyptian deity variously depicted as having the head of a baboon or an ibis, and this might have been a convenient route to follow, given the longstanding Egyptian theme here and the fact that Thoth has considerable personal resonance for your correspondent. But look again at the stony visage in the top picture: let’s face it, that’s not a baboon, is it. And so no interpretation presented itself, nothing ignited in the crucible. Until I realised why. Hanuman symbolises the mind: the powers of consciousness but, more specifically, the mind’s wandering, erratic nature – what practictioners of Eastern meditation techniques call ‘monkey chatter’ – the ceaseless, fruitless mental babble of anxieties great and trivial, trifling distractions and transient enthusiasms. The ‘monkey chatter’ that must be tamed if we are to awaken into awareness. My mulling over of meaning, my nervous picking at the fabric of the Shoreline’s grand design, was so much ‘monkey chatter’. I had to try to switch it off. It would be self-defeating to attempt to analyse this further. 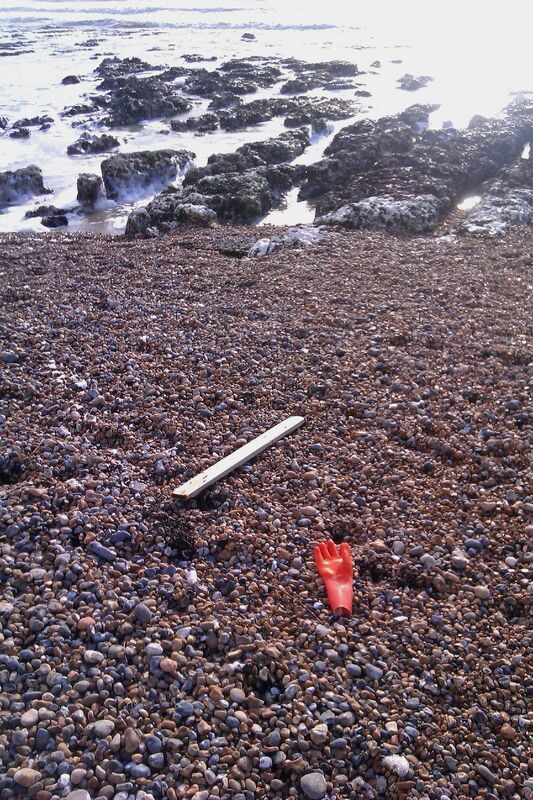 As with the previous post, the latest message from the Shoreline comes in the form of synthetic detritus, washed up from the depths onto the beach, on this occasion at Birling Gap, near Beachy Head, a place I hadn’t visited for a while. 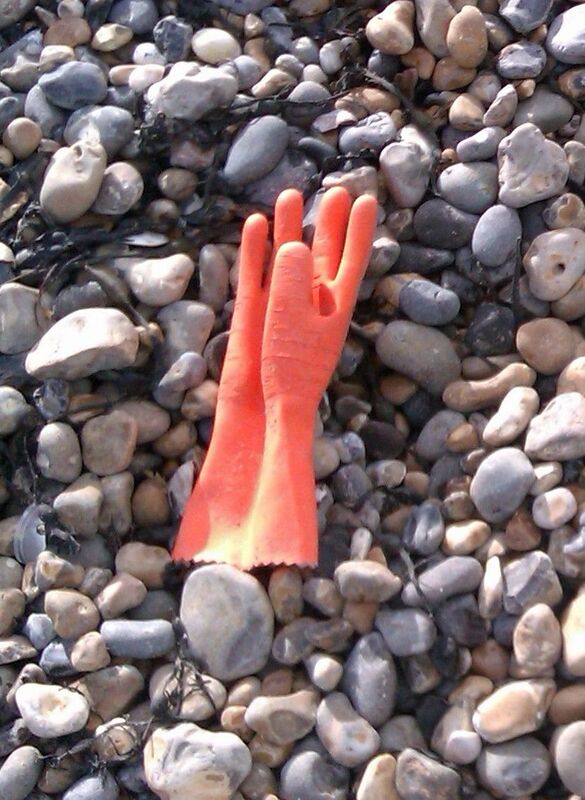 A recent stroll along the shore there yielded a number of interesting and, in some cases, amusing finds. 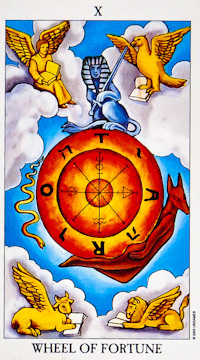 This card drips with allusions – the angel, eagle, lion and bull arranged around the corners are the symbols of the four Evangelists… the letters on the Wheel itself can be read as ‘TORA’, ‘ROTA’ or ‘TAROT’… the interspersed Hebrew letters form the Tetragrammaton, the name of God in Judaic tradition. Then there’s the serpent wriggling down one side of the wheel, an image we have considered many times (for example here). But here I want to focus on the horned figure that seems to be carrying the Wheel, or perhaps rising into manifestation as the Wheel turns. Most sources seem to agree that this is a representation of our old friend Anubis. 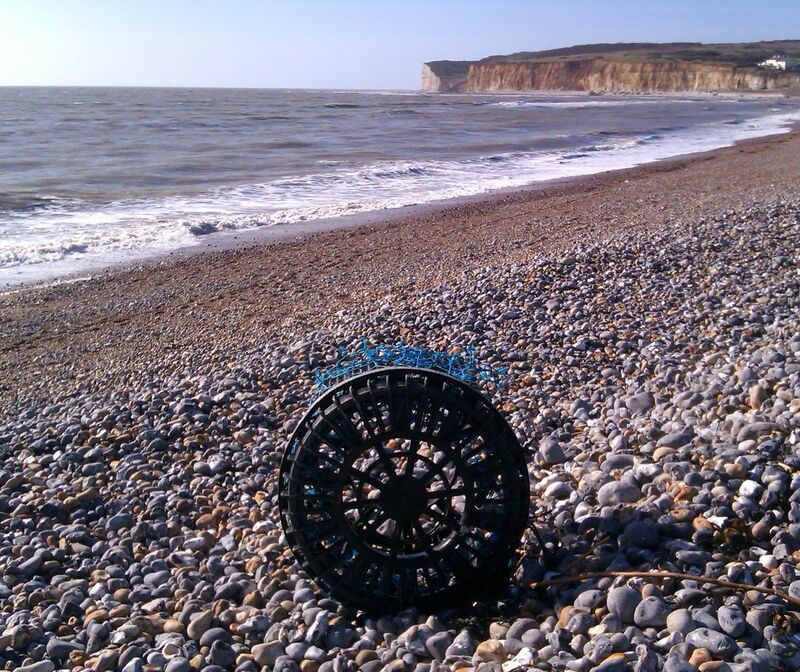 The combination of Anubis and the turning Wheel is particularly apposite for the Haunted Shoreline, as Anubis was the start of this quixotic venture, back in December 2011. It was the discovery of the flint ‘head of Anubis’, also at Birling Gap, that signalled to me that it was time to embark on this psychonautical cave-diving expedition: not only was the find simply too striking to ignore, but it was also entirely appropriate, because Anubis, as we have seen elsewhere, is the guardian of the underworld, and accompanies the deceased as they make the transition from the waking world to the afterlife, from the mundane to the imaginal… or, in Shoreline terms, from land to sea. Anubis seemed the perfect starting point, not only for me, but for visitors to the blog – an initiatory presence that would guide them into the world of the Haunted Shoreline (at this point, I naively imagined that interested readers would begin at the beginning and work their way through the thing, and its various interconnected strands, as if it were a kind of novel or map. But I soon realised that most internet surfing is done in gadfly fashion; very few people engage with a website the way they might with a book). I have often considered revisiting Anubis and saying more about his initiatory aspect here – that original post, simply a pair of images and a link to a painting I considered very relevant – was perhaps too idiosyncratic and allusive to convey the meanings at which I was aiming. But somehow it has never seemed the right time. Until now. The winter storms have passed at last, Spring is here, the Wheel Of Fortune turns, and we are back where we started. Maybe the period of time between then and now is a Shoreline Year, or something. Maybe this is even the end of the project – as ever, I have no clear idea of where it will go next, instead I simply await further signs from the beach, and from the ebb and flow of daily life. Meditate on this. Tell everyone you know, and keep watching the shores. 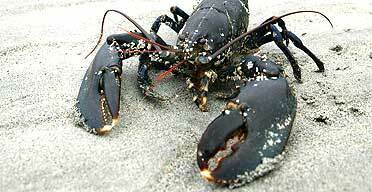 The lobster is out of its pot. … and immediately the phrase the mind in the cage bobbed up from the depths onto the shores of my consciousness. 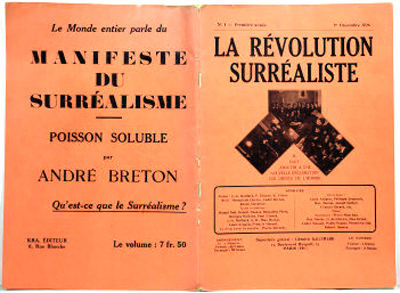 This painting predates the Surrealist movement by a decade, but its motif of familiar objects in unfamiliar and dreamlike juxtaposition is clearly proto-surrealist and it was a key influence on the subsequent art and method of the Surrealists. Put these pieces together, and the meaning becomes apparent. The anger of the storm, the turmoil of the ocean… all this is the violent upheaval- some might call it a revolution – required to blow open the doors of our mental cages and take the dizzying leap into the Marvellous. The psychological and political implications are clear. One may not draw comfort from this, but one can imbibe something altogether rarer: hope.